Theodore Millon, Ph.D., D.Sc. is one of the world's leading authorities on personality disorders. 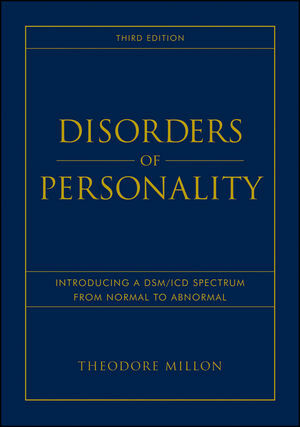 Developer of the widely used Millon personality assessment inventories, he has been the editor of the Journal of Personality Disorders, President of the International Society of Personality Disorders, and a key member of the DSM-III, DSM-IV, and and key advisor to the DSM-5 committees on personality disorders. Dr. Millon is retired Professor of Harvard Medical School and the University of Miami. He is currently Dean and Scientific Director of the Institute for Advanced Studies in Personology and Psychopathology in Coral Gables, FL. He is author of numerous other Wiley books, including Masters of the Mind: Exploring the Story of Mental Illness from Ancient Times to the New Millennium, Personality Disorders in Modern Life, 2E, and Wiley's forthcoming 15-book Normality to Abnormality Personality Series.